Includes two storage boxes measuring 9" x 4.25" x 1.25" (inside dimensions) with up to 18 divided compartments. Organizers have 3 fixed compartments and 15 snap-in adjustable dividers. Compartment dividers go all the way to the top and items stay put when the box is latched and turned upside down -- so it's a great container for small pieces like beads. 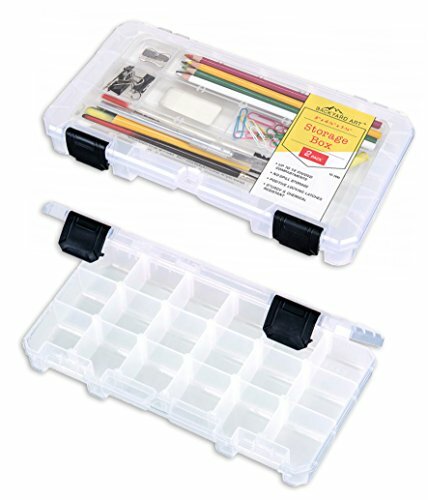 Also a perfect solution for artist pencils and pens, screws, findings, tabletop game piece storage, knitting notions, sewing notions, your junk drawer -- and the boxes fit easily into your backpack or cabinet. Durable black positive locking latches stay closed and won't break off with use like many clear fixed latch models. The mechanical hinge allows you to fully remove the lid and then easily pop it back on. These containers are Made in the USA from translucent polypropylene. This material has many benefits: Durability (it won't crack like the plastic clear boxes), Visibility (you can see the contents), and Chemical Resistance (it's impervious to most household chemicals, solvents, gasoline, polymers, and oven-bake clays like Sculpey and FIMO). Note: Items pictured in the box are not included. BUNDLE OF TWO: This set comes with two boxes measuring 9" x 4.25" x 1.25" with up to 18 divided compartments. *Dimensions are the inside dimensions. Items pictured in box not included. NO-SPILL STORAGE: Has 3 fixed compartments and 15 snap-in adjustable dividers to make up to 18 areas you design. Perfect for home, school, office and travel. STURDY & CHEMICAL RESISTANT: Durable black positive locking latches stay closed and won't break off with use. Mechanical hinge. Made in the USA from translucent polypropylene. GREAT SIZE: Perfect for knitting notions, art supplies, pens and pencils, beads, screws, game piece storage, etc. KEEP OR GIVE: Every household can get organized with these. They make terrific presents to fill with goodies. Fishing tackle items, screws and hooks, beads, sewing supplies, and marker pens and pencils for back to school. View More In Organization, Storage & Transport. If you have any questions about this product by Backyard Art, contact us by completing and submitting the form below. If you are looking for a specif part number, please include it with your message. LARGE Telescoping Adjustable ART Tube. GREAT Storage Holder Case for Document, Poster, Maps, Scrolls, Photos, Drawings, Prints, Blueprint, Artwork, Arrows, Photographs, Transport & Mailing. Expandable to 42 inches - WATER & Light Resistant.